James Graham studies citrus canker epidemiology and control by integrated management, as well as management of health of trees affected by belowground pathogens and pests and the systemic bacterial disease, huanglongbing (HLB, or citrus greening). Graham’s research focuses on the area of microbiological relationships of citrus and citrus soils, and the advancement of his findings for development of management tactics that sustain tree health. Thus far, Graham’s research has led to improved integrated management strategies for above- and below-ground diseases and pests that reduce productivity of citrus. 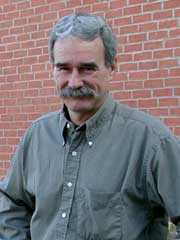 Graham’s accomplishments include identifying best seasonal management tactics with conventional and new materials for control of bacterial citrus canker, demonstrating that fruit grown in canker-prone areas are not an avenue for transmission of the bacterium, opening movement of fresh fruit into canker-free markets, as well as utilizing systemic acquired resistance as a tool to control the disease in groves. Graham is also a leader in huanglongbing (HLB, or citrus greening) research. His work identified the increased susceptibility of HLB-infected trees to Phytophthora root rot, and defined control strategies to mitigate losses. He also documented and extended research from large-scale trials in Brazil and Florida that demonstrated tree rouging as a viable strategy to control HLB. Below ground, Graham is participating in research leading to new understandings about the role of entomopathogenic nematodes on citrus insect pests such as Diaprepes root weevil. To complement his research leadership strengths, Graham is active in interdisciplinary programs across IFAS units, and among research agencies and industry groups worldwide. He is well known in the citrus industry and works regularly with individual growers and stakeholders.